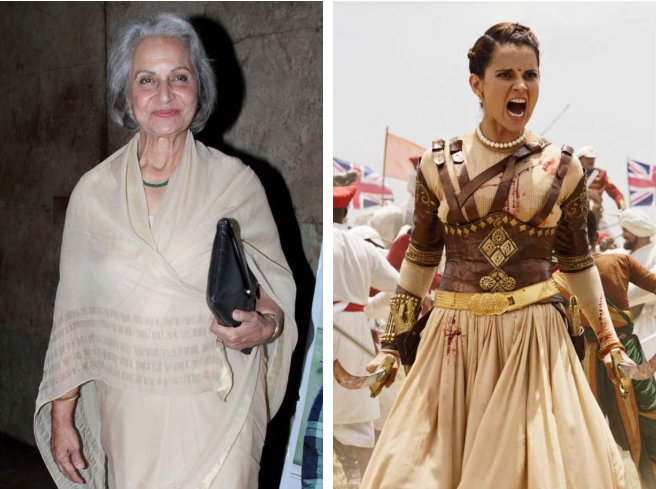 Veteran actress Waheeda Rehman is proud of actress-turned-director Kangana Ranaut for directing a film like Manikarnika: The Queen of Jhansi and also giving a great performance. Waheeda Rehman, 80, was interacting with the media at its special screening along with another veteran Asha Parekh, 76, on Wednesday here. In fact, she said, "I called Kangana to show me this movie because I was very keen. I really liked the film. She has done a really good job - acting and directing. She is also looking very beautiful in the film. I am so happy and proud of her that she has made this film and given a great performance as well," said the actress, who ruled the silver screen for decades. Asha Parekh, who was the top actress in Bollywood in the 1960s and 70s, too, praised Kangana. "She has done a lot of hard work for the film and she has done a really nice job. She looks exactly like the Rani of Jhansi, regal in every aspect. I hope the film runs for a very long time." Manikarnika: The Queen of Jhansi managed to collect Rs 52.40 crore at the domestic box-office in five days.